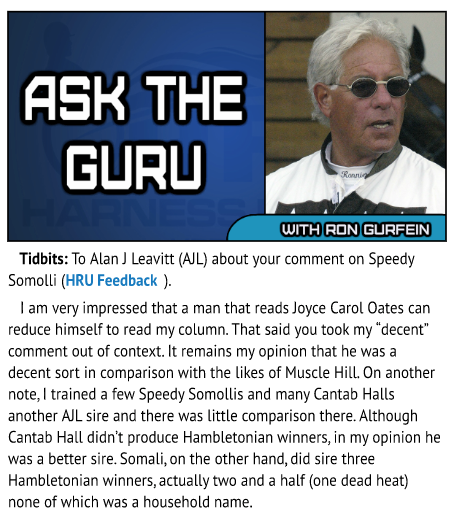 Speedy Somolli a decent stallion? What a mockery! The question is not in which trotter Speedy Somolli has left his mark, but in which not! But let's take it chronologically. Speedy Somolli was a hot three-year-old who won one of the most spectacular Hambletonians in two heats against Florida Pro and Brisco Hanover in 1978. Speedy Somolli also spawned three Hambo winners, Nuclear Kosmos (1986), who failed due to early fertility weakness as a stallion, Park Avenue Joe (1989, Dead Heat with Probe, anyway, a winner is a winner ...) a good stallion in Italy at Toniatti, and Alf Palema (1992), who came to Sweden and there a terrific stallion and of course "Elithingst" was, five times in a row, he won the stallion championship in France next to Europe's most important Trotting Country. Alf Palema was a star in his new home and lived in a villa, comparable probably only with Mack Lobell on Menhammar Stuteri. But Speedy Somolli's biggest achievement in the breed was probably Baltic Speed. Born to a relatively decent dam line, the Lady Hurd (No. 49 in the world's best maternal lines), this trotter, born in size, was the father of a truncheon and revolutionized harness racing by producing Valley Victory. It's hard to understand why it was Speed Speedy Somolli, but we believe in the latter. Anyway, Speedy Somolli produced a myriad of world class traders (see here) and what more than great damsire (see here). He left his mark mainly in Sweden and France, an international stallion champion like Love You (champion stallion in France, Sweden, Germany, Holland, Austria, etc.) would be inconceivable without his genes. When Speedy Somolli won the Hambletonian in 1978, I was 12 years old. I first saw him live in 1984, back then in the stud farm Mutzenhof in Bavaria. I went to his stable, which was locked with two locks, then shot this little horse in my direction and defended his territory. Stud manager Gösto Novak took Speedy Somolli out of the stable to take some pictures. It was obvious that he was infertile, he never sired a German offspring. The thing went to the court. Speedy Somolli was joined by his pony friend Edvin, who came with him from Sakndinavien, and had no chance against the kid.